Brock embodies the definition of eclectic. A small-town welder and farmer by trade, his love of music, most notably percussion, has remained a constant passion. 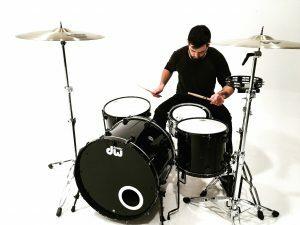 Brock spent the early years of his music career drumming in a variety of bands from Metal Core/Alternative Rock to Folk/Americana, gaining knowledge and skills across multiple genres. A talented songwriter, his songs and collaborations have made their way onto multiple EPs and albums, including former band “Framing Fables” debut album “Away From Home”. In recent years, Brock has switched gears to perform as a session drummer, both in studio and on stage. In his travels to Nashville, Tenn. He recorded percussion for the Nashville-based duo Haunted Like Human on their “Ghost Stories” album, and recorded on the group’s latest EP, “Folklore.” Brock has stepped in on screen with several groups including the Nashville-based singer-songwriter Sully, for her debut single “Hipster Heartbreak” music video. While Brock’s preference is playing “heavier tracks,” he prides himself on versatility, which he views as a necessity for session work. He has recorded in several different studios across the nation, and has had the privilege of sharing the stage with bands such as Old Dominion, Smile Empty Soul, The Slants, Stitched up Heart, and many others. Brock appreciates opportunities to work with accomplished drummers such as Garrett Goodwin (Drummer for Carrie Underwood) who he credits with helping him define his goals and better understand the industry. His love of networking and sharing knowledge has inspired him to begin coaching and helping fellow musicians find their way in the music industry while fine tuning their abilities. His ultimate goal is to find a steady gig, and continue to perform session work in between recording and touring. “I have used Drum Dial Tuners for years, in and out of the studio. It’s literally an item I keep with my drums at all times. I wouldn’t want to record without one, as I know after using it, they are tuned exactly how I want them based on the situation”.